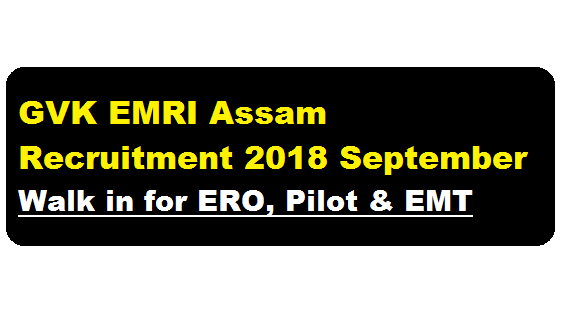 GVK EMRI Assam Recruitment 2018 September | Walk in for ERO,Pilot & EMT : GVK Emergency Management & Research Institute has published a recruitment notification in the month of September 2018 for various posts. According to the latest GVK EMRI Assam recruitment 2018 September, GVK EMRI Assam invites candidates for walk-in interview for filling up ERO , Pilot & EMT posts. The details of the vacancy are discussed in below section. In this section, we will discuss in detail about Recruitment of various post under GVK Emergency Management & Research Institute Assam Recruitment 2018 September with all the details and requirement. Language preference: English, Hindi, Assamese, Bengali and any other local language. Experience in Call Centre will be preferred. Qualification: Any Science graduate with Biology as a subject in HSSLC. Please carry your updated bio-data and originals of all relevant educational certificates, PAN card. Address proof and other testimonials (with photocopies) with correct phone number to the following address. Note: Canvassing in any form will lead to disqualification of candidature.